The annual tradition of Crossover Day is today, and it continues into the night as we share this week’s update with you. Crossover Day marks the final day of the legislative session that bills must pass out of the chamber that they originate in (either the House or the Senate) and crossover to the other chamber for consideration. Lawmakers were in session for nearly nine hours last year. After lunch and dinner breaks (and lots of coffee! ), the House stayed in session until 9:00 pm. Here are the early highlights for today’s Crossover Day and last week. Spencer’s House Bill 750 Passes the House! Spencer took to the well this morning to present House Bill 750 before the whole house. House Bill 750 allows for non-profit organizations that promote access to affordable housing to be exempt from the requirement of getting a state license to offer low-interest mortgages. It was Spencer’s first presentation of a bill before the House, and the legislation passed 164 to 2. House Bill 750 now moves to the Senate for consideration. 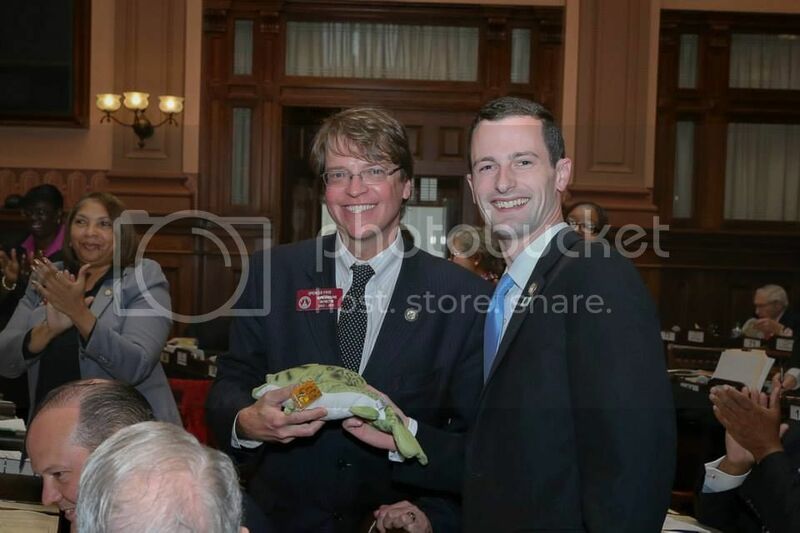 As is tradition with freshmen legislators who pass their first bill, Spencer received the Freshman Bass from Representative Michael Caldwell of Woodstock. Stay tuned for a full update on the legislation from Crossover Day later this week. Last week was no sleeper either. The House considered over 80 bills during legislative days 27, 28 and 29. A full list of the legislation can be seen on each daily report here. These are a few of the highlights. On Monday, the House passed House Bill 251 by a vote of 164 to 2. This legislation prohibits the sale of electronic cigarettes and nicotine gum, patches and other nicotine products to anyone under the age of 18. This legislation aligns the regulations on these products with those of cigarettes and chewing tobacco and protects the health of people under the age of 18. On Monday, the House also passed legislation strengthening the protections against Medicaid fraud. House Bill 973 allows for any person who knowingly conspires to file false Medicaid claims or tries to defraud Medicaid to face civil penalties of up to $11,000 per false claim. This legislation protects the integrity of the Medicaid program and ensures that each dollar spent goes towards helping low-income families and children have access to quality health care across the state. House Bill 973 passed 171 to 0. On Tuesday, the House passed the 9-1-1 Medical Amnesty Law that provides amnesty to individuals seeking emergency medical assistance for a drug overdose or amnesty for a person who helps someone else to seek emergency medical assistance. The person seeking help or assisting would not be arrested, charged or prosecuted for a drug violation if the evidence for the arrest resulted solely from seeking medical assistance. Similar to laws allowing uninsured patients facing life-threatening emergencies to receive treatment, this allows people who overdose on illegal substances to seek potentially life-saving treatment. The 9-1-1 Medical Amnesty law passed 144 to 20. Georgia drivers will get reprieve from slow drivers in the left lanes of Georgia highways. On Wednesday, the House passed House Bill 459 that states that drivers should not be in the left lane of multi-lane traffic when another driver is attempting to pass them from behind. Dubbed as the slow-poke bill, this legislation will help keep our highways safer and should remind drivers not to impede traffic if they would like to drive a little slower. House Bill 459 passed 162 to 9. Finally, the House passed House Bill 886 on Wednesday. This legislation requires that school districts hold at least two public hearings regarding their annual budgets. Budgets will be provided electronically through the websites of school districts and remain available until the next budget is adopted. This legislation applies to all Georgia public school districts and all Georgia charter schools including statewide charters. This places school districts in line with all other state entities that hold public budget hearings and provides an opportunity for the community to engage in the process of determining the financial priorities for our schools. The end of the session is right around the corner. Days 31-40 will fly by, as legislation that passed the Senate will come to the House for consideration. Stay tuned for a Crossover Day wrap-up later in the week and follow us on Facebook and Twitter for the latest updates. Have a great week!